Adapter for SFP / SFP+ transceiver optical and ethernet modules for REVELPROG-IS programmer. SFP adapter for SFP / SFP+ transceiver optical and ethernet modules. Work with REVELPROG-IS programmer. Tape for connection in set. 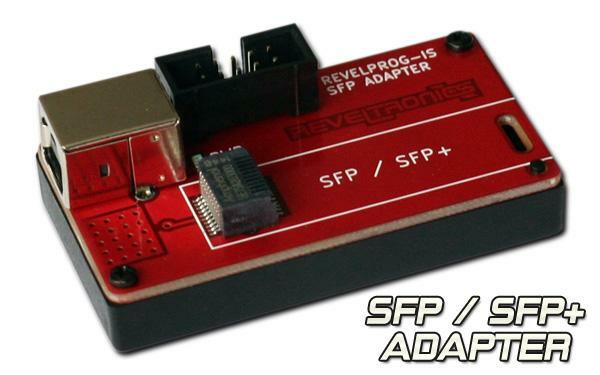 Adapter allows to cloning and programming unprotected SFP / SFP+ modules with REVELPROG-IS. It is possible to read SFP/SFP+ module in MSA standard, change configuration area (manufacturer name, part name, serial number, configuration bytes etc.) , calculate checksums and write new config to the module. In this tricky way you can make compatible any SFP/SFP+ not secured ethernet / optical (fiber) transceivers with ethernet device, e.g. buy OEM module, programm it with other manufacturers config and make compatible with any router. washco_infosys · 3 years ago.